While this is not entirely aimed at stills photographers, I could not help but be interested in Engadget’s article about the winner of Microsoft’s Robotics @Home contest. 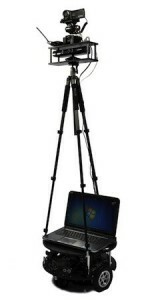 The winning concept was the SmartTripod. The inspiration of the project by Arthur Wait, was to create a video rig that could be used for shooting DIY, hobby etc home videos as a one man team. Check out his technical video below on how the rig is made up.